From checking your car’s tyres and electrics to techniques for driving on snow and ice, winter driving requires careful planning. Follow these ten simple tips and you’ll be equipped with all you need for safe and successful winter road trips. What car checks should I carry out before a winter drive? 1. How to check your car tyres are safe? Check all tyres (including the spare) are free from damage, tyre pressure is at the recommended level, and during winter all tyres have at least 3mm of tread. Also, consider fitting winter tyres which are designed to provide superior grip when temperatures fall below 7ºC. 2. How to check your engine won’t freeze? Check the engine cooling system to avoid freezing or overheating. Ensure that your coolant level is topped up and check coolant hoses before setting off on a long journey. 3. How to check your car needs an oil change? Check your oil levels periodically. As with coolant, if it's time or nearly time to have your oil changed, do it before you leave on your road trip. If you’re thinking ‘what oil’s right for my car?’, then contact your Toyota authorised dealer. 4. How to check your car’s electrics? Check the battery terminals are clean and tight. Due to the extra demands of using lights, heating and wipers, if your battery is over five years old, have it tested by your Toyota authorised dealer. 5. How to check your car’s lights? Check your lights before you set-off. They are essential for you to see and be seen by others. Walk around your car and make sure that all lights are working and free from dirt and grime that builds up in winter. 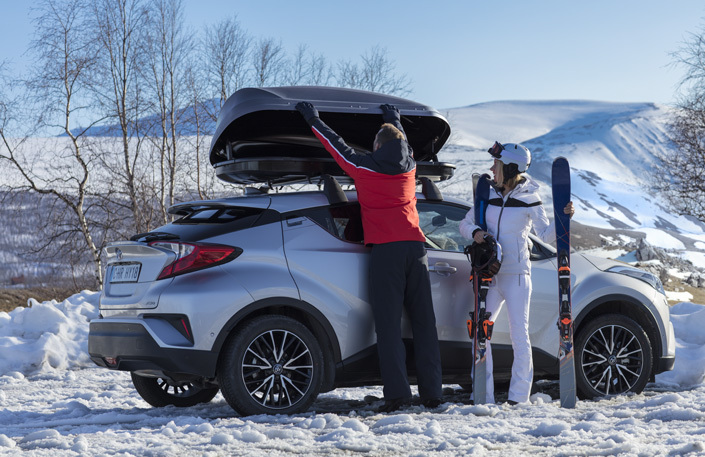 Discover the range of Toyota winter accessories for your car. What are the important things to remember on a winter drive? 6. How to improve visibility when driving in winter? Windscreens get dirty quickly in winter. Ensure your windscreen reservoir is regularly topped-up with a screenwash that’s effective to at least -15ºC. Check that the wipers are free of damage and fit new blades if necessary. Finally, always clear any snow from the roof before you set-off. 7. How to stay alert on long drives? Driving can be tiring in challenging winter conditions. Always take a 15-minute break every two hours on a long journey. For maximum alertness, stop for a snack, stretch your legs and always drink plenty of water to stay hydrated. Keep entertained with a driving playlist or catch up on your favourite shows with a Bluetooth® radio. 8. How to drive on snow and ice? Stopping distances in snow and ice can increase by as much as 10 times compared to dry conditions. Drive slowly and always try to be smooth with your braking, accelerating and steering to avoid unsettling the car and risk losing control. 9. How to pack your car for a road trip? Ensure heavy items are stowed on the boot floor behind the rear seats. If you need more space, use a roof rack and easy to install luggage box for added storage. If you’re towing a trailer, ask a professional to install a high-quality tow-hitch. Finally, if you're bringing pets along, ensure your dog car carrier is good quality and correctly installed behind the seats. 10. What to pack in case of an emergency? Always be prepared for an emergency in winter. Keep warm clothes, waterproofs and sturdy footwear in your car at all times. Items such as a working torch, mobile phone charger, shovel and extra water and snacks are invaluable should you become stranded. With its darker, colder days and uncertain driving conditions, winter can come as a shock. But if you’re prepared with Toyota’s range of accessories and car checks, you can take on anything winter throws at you this year – and win. Parking Aids Technology that gives you more confidence when parking Nine tips for a successful summer road trip From keeping your cool to topping up on fluids, follow these nine simple tips and you’ll be equipped with all your summer road trip essentials. Toyota Service Promise The Toyota Service Promise is to keep your Toyota a Toyota. Discover the ways we are committed to taking the best care of you and your Toyota. Toyota Genuine Windscreens When driving your Toyota, you want to know that you can rely on your windscreen for excellent visibility and protection from the elements.